While top bureaucrats in the Prime Minister's Office (PMO) may have worked overtime to "lobby" and "manage" certain well-known international institutes (click HERE) in order to show how Modi's popularity is on the rise and the economy under him is looking up, it appears, they have been less successful with certain institutes. One of them seems to be is the World Economic Forum (WEF), based in Zurich, known for "uniting" world political, business and academic leaders for economic development. 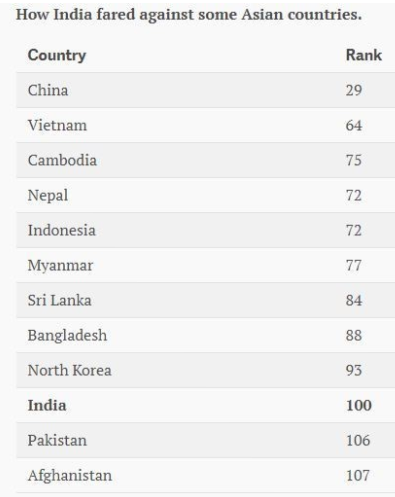 If only a few weeks ago, WEF came up with a comprehensive report ranking India's global gender index at 108th among 144 countries, it has now approvingly comments on a high profile Washington report, "India is hungrier than North Korea." Pointing out that India has slipped in Global Hunger Index (GHI) from 97th to 100th rank, WEF, in a short but succinct commentary, notes how India, "home to the world’s second-largest population, fared poorly on the GHI for 2017" in a report "released by the Washington-based International Food Policy Research Institute (IFPRI)." The rankings are based on four indicators: undernourishment, child mortality, child wasting, and child stunting. A GHI score of between 20 and 34.9 points reflects serious hunger levels; between 35 and 49.9, it is alarming, and extremely alarming if over 50. WEF says, "This pulled down the overall rankings of the south Asian region, making it the worst performer on the GHI, closely followed by Africa south of the Sahara. In fact, African countries such as Botswana (81) and Burkina Faso (92) fared much better than India, as did some middle-eastern nations like Iraq (78)." PK Joshi, director of IFPRI South Asia, has been quoted as saying that even though India has a host of schemes to fight hunger, “drought and structural deficiencies have left a large number of poor in India at risk of malnourishment in 2017 despite the rapid economic progress made by Asia’s third-largest economy, which is also the world’s second-largest food producer." Says WEF, "High poverty rates and unequal distribution of wealth have left millions of households without access to nutritious food. While India has remarkably reduced its child stunting rate -- down 29% since 2000 -- the child wasting rates (children under five who have low weight for their height) remain high. In 2015-16, some 21% of Indian children suffered from wasting, up from 20% a decade ago." The IFPRI report says, "Given that three-quarters of South Asia’s population resides in India, the situation in that country strongly influences South Asia’s regional score. At 31.4, India’s 2017 GHI score is at the high end of the serious category. According to 2015–2016 survey data, more than a fifth (21 percent) of children in India suffer from wasting." It adds, "Only three other countries in this year’s GHI -- Djibouti, Sri Lanka, and South Sudan -- have data or estimates showing child wasting above 20 percent in the latest period (2012–2016). Further, India’s child wasting rate has not substantially improved over the past 25 years." 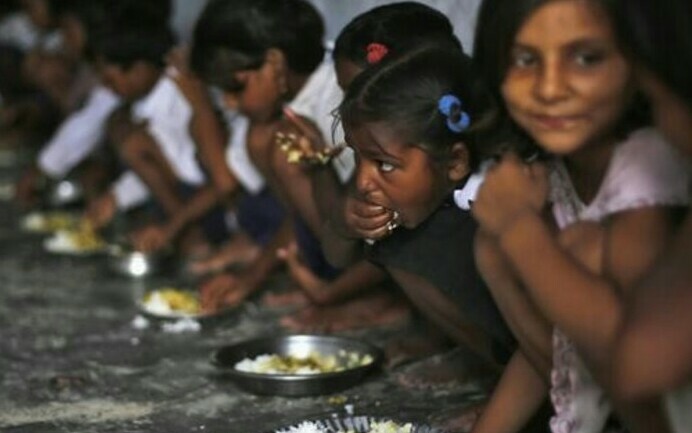 Referring to India's “massive scale-up” through two national programmes that address nutrition -- the Integrated Child Development Services and the National Health Mission -- IFPRI says, these "have yet to achieve adequate coverage." (3) household access to improved sanitation facilities -- a likely factor in child health and nutrition -- which stood at 48.4 percent as of 2016."